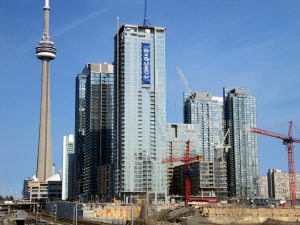 Toronto saw 3,280 housing starts in February 2013, up 43 per cent from 2,299 during the same time last year, according to new numbers just released from the Canada Mortgage and Housing Corporation (CMHC). 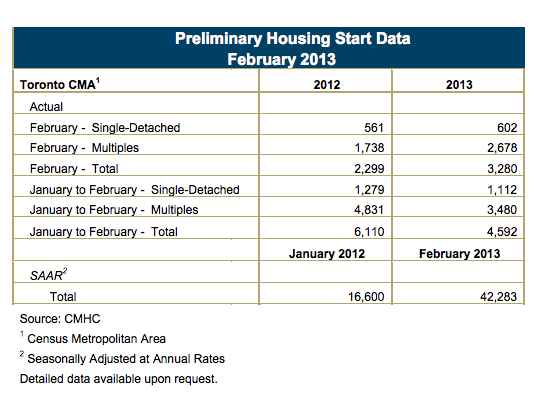 While January 2013 saw 1,312 actual starts, February saw a much healthier 3,280 starts for an increase of 150 per cent. But the total actual year-to-date starts dropped compared to the same time in 2012: there were 4,592 starts in 2013, down by roughly 25 per cent from 6,110 the year before. The standalone monthly seasonally adjusted annual rate was 42,300 units in February 2013 up a whopping 155 per cent from 16,600 in January. Meanwhile, the six month moving average of the monthly seasonally adjusted annual rates was trending at 38,500 units in February. 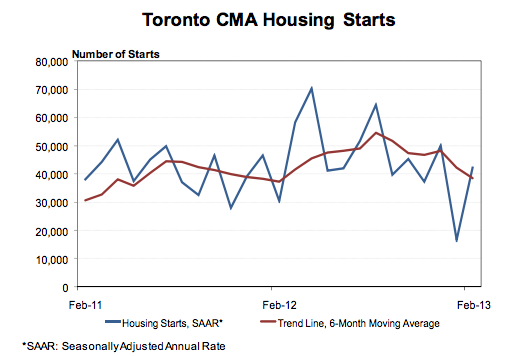 “Housing starts for both singles and multiples recovered from low levels in January to move back in line with the trend in February,” Shaun Hildebrand, CMHC’s Senior Market Analyst for Toronto.